Neutron stars are created when giant stars die in supernovas and their cores collapse, with the protons and electrons essentially melting into each other to form neutrons. Neutron stars are city-size stellar objects with a mass about 1.4 times that of the sun. Born from the explosive death of another, larger stars, these tiny objects pack quite a punch. Let's take a look at what they are, how they form, and how they vary. Neutron stars pack their mass inside a 20-kilometer (12.4 miles) diameter. They are so dense that a single teaspoon would weigh a billion tons — assuming you somehow managed to snag a sample without being captured by the body's strong gravitational pull. On average, gravity on a neutron star is 2 billion times stronger than gravity on Earth. In fact, it's strong enough to significantly bend radiation from the star in a process known as gravitational lensing, allowing astronomers to see some of the back side of the star. The power from the supernova that birthed it gives the star an extremely quick rotation, causing it to spin several times in a second. Neutron stars can spin as fast as 43,000 times per minute, gradually slowing over time. If a neutron star is part of a binary system that survived the deadly blast from its supernova (or if it captured a passing companion), things can get even more interesting. If the second star is less massive than the sun, it pulls mass from its companion into a Roche lobe, a balloon-like cloud of material that orbits the neutron star. Companion stars up to 10 times the sun's mass create similar mass transfers that are more unstable and don't last as long. Stars more than 10 times as massive as the sun transfer material in the form of stellar wind. The material flows along the magnetic poles of the neutron star, creating X-ray pulsations as it is heated. By 2010, approximately 1,800 pulsars had been identified through radio detection, with another 70 found by gamma-rays. Some pulsars even have planets orbiting them — and some may turn into planets. Some neutron stars have jets of materials streaming out of them at nearly the speed of light. As these beams pan past Earth, they flash like the bulb of a lighthouse. Scientists called them pulsars after their pulsing appearance. Normal pulsars spin between 0.1 and 60 times per second, while millisecond pulsars can result as much as 700 times per second. When X-ray pulsars capture the material flowing from more massive companions, that material interacts with the magnetic field to produce high-powered beams that can be seen in the radio, optical, X-ray or gamma-ray spectrum. Because their main power source comes from the material from their companion, they are often called "accretion-powered pulsars." "Spin-powered pulsars" are driven by the stars rotation, as high-energy electrons interact with the pulsar's magnetic field above their poles. Young neutron stars before they cool can also produce pulses of X-rays when some parts are hotter than others. As material within a pulsar accelerates within the magnetosphere of a pulsar, the neutron star produces gamma-ray emission. The transfer of energy in these gamma-ray pulsars slows the spin of the star. The flickering of pulsars is so predictable that researchers are considering using them for spaceflight navigation. "Some of these millisecond pulsars are extremely regular, clock-like regular," Keith Gendreau of NASA's Goddard Space Flight Center in Maryland, told members of the press in 2018. "We use these pulsars the same way we use the atomic clocks in a GPS navigation system," Gendreau said. The average neutron star boasts a powerful magnetic field. Earth's magnetic field is around 1 gauss, and the sun's is around a few hundred gauss, according to astrophysicist Paul Sutter. But a neutron star has a trillion-gauss magnetic field. Magnetars have magnetic fields a thousand times stronger than the average neutron star. The resulting drag causes the star to take longer to rotate. "That puts magnetars in the No. 1 spot, reigning champions in the universal 'strongest magnetic field' competition," Sutter said. "The numbers are there, but it's hard to wrap our brains around them." These fields wreak havoc on their local environments, with atoms stretching into pencil-thin rods near magnetars. The dense stars can also drive bursts of high-intensity radiation. "Get too close to one (say, within 1,000 kilometers, or about 600 miles), and the magnetic fields are strong enough to upset not just your bioelectricity — rendering your nerve impulses hilariously useless — but your very molecular structure," Sutter said. "In a magnetar's field, you just kind of … dissolve." With the highest density of any known space object, neutron stars can beam radiation across the galaxy. Like normal stars, two neutron stars can orbit one another. If they are close enough, they can even spiral inwards to their doom in a intense phenomena known as a "kilonova." The collision of two neutron stars made waves heard 'round the world in 2017, when researchers detected gravitational waves and light coming from the same cosmic smashup. 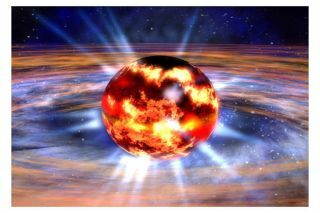 The research also provided the first solid evidence that neutron-star collisions are the source of much of the universe's gold, platinum and other heavy elements. "The origin of the really heaviest chemical elements in the universe has baffled the scientific community for quite a long time," Hans-Thomas Janka, a senior scientist at MPA, said in a statement. "Now, we have the first observational proof for neutron star mergers as sources; in fact, they could well be the main source of the r-process elements," which are elements heavier than iron, like gold and platinum. The powerful collision released enormous amounts of light and created gravitational waves that rippled through the universe. But what happened to the two objects after their smashup remains a mystery. "We don't actually know what happened to the objects at the end," David Shoemaker, a senior research scientist at MIT and a spokesman for the LIGO Scientific Collaboration, said at a 2017 news conference. "We don't know whether it's a black hole, a neutron star or something else." The observations are thought to be the first of many to come. "We expect that more neutron-star mergers will soon be observed, and that the observational data from these events will reveal more about the internal structure of matter," study lead author Andreas Bauswein, from the Heidelberg Institute for Theoretical Studies in Germany, said in a statement.